Greetings from Paducah! Wendy and I arrived this evening and we’ll be helping to hang the show tomorrow. God is good :-)! I decided I needed to do a bit of follow up on my window view challenge. 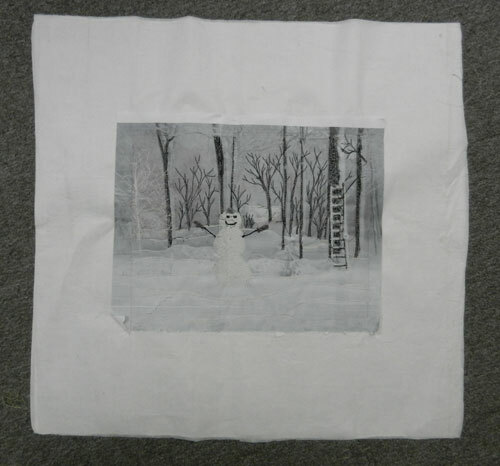 I haven’t received any pictures of quilts from those who sent me view pictures, but I did get my snowman quilt done. 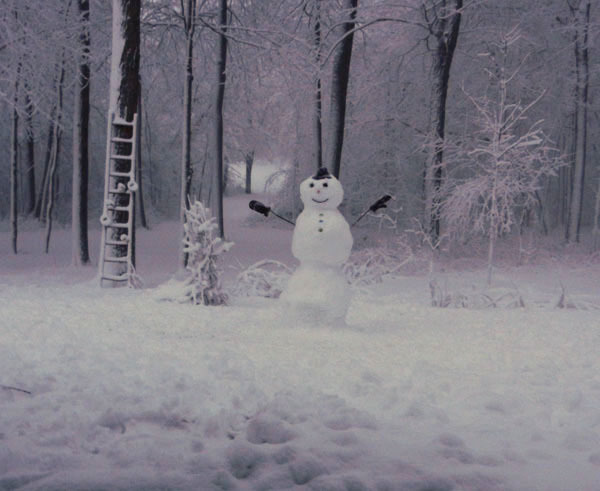 We haven’t had a flake of snow since 3 days after this picture was taken. So, I decided I’d better share it now before summer is upon us. I decided to try a number of new techniques. To begin with I chose a vintage damask napkin for the background with the idea of creating the scene as a wholecloth on it. Step 1 – I reversed the image on the computer and then enlarged it on the computer using the instructions in my May 23rd post. Step 2 – I ironed Decorbond ™ stabilizer to the back of the napkin and pinned the enlarged picture to the center of the stabilizer. 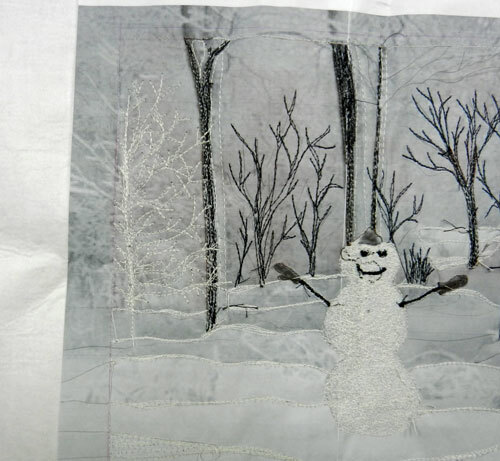 Step 3 – On the paper pattern side I free motion stitched around all the trees, the snowman and the snow drifts using bobbin thread to match each area. Step 4 – I turned to the napkin side and colored in the trees and shadows with watercolor pencils. Then I took a damp q-tip and blended the colors. Step 5 – I thread painted everything from the napkin side (this is how the paper side looked after the thread painting). 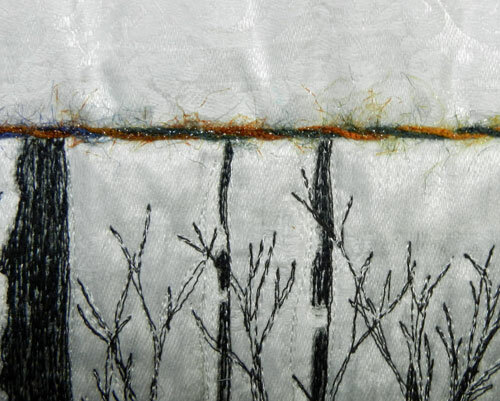 Step 6 – I removed all the paper and layered the napkin with batting and backing. 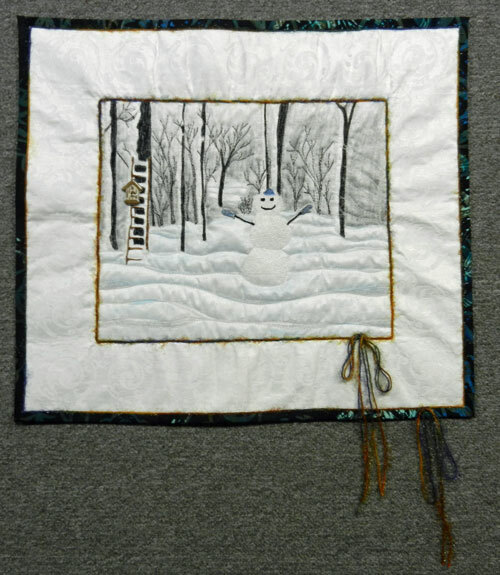 Step 7 – I quilted around the main objects and the border (frame of the picture) and then bound the edges. and Voila! A fun experiment and a unique quilt! Stay tuned – next week I’ll bring you the inside scoop on Paducah!